In the spring of 2010 I was standing in front of a classroom of New York State corrections officer trainees as part of a semi-official exchange program. I was impressed with their discipline, esprit de corps, and professionalism. It brought back memories of my U.S. Army basic training days, which was very different from my initial training as a police officer in the U.K. 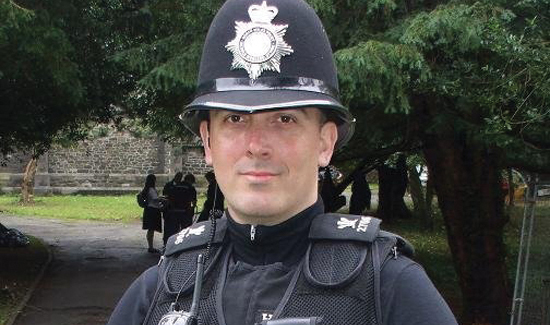 I became a constable with North Wales Police in 2007. The centralized selection process had included extensive role-play scenarios as a customer service representative. As training began, one of the first things I learned was that I was employed by a police “service” rather than “force.” Policing by consent was repeated often. Student-presented PowerPoint lectures, e-learning, and self-study dominated. There were relaxed uniform standards, tests that did not always require a passing grade, and a casual atmosphere to the non-residential training facility. It could not have been further from my U.S. Army training of the 80s, and was not at all what I was expecting. There is a lot of talk about militarization of the police these days. This is often seen in a negative light and dismisses the positive aspects of policing that can be taken from a paramilitary structure. But there are many things from the military experience that are very useful to law enforcement. Those things should be included, and we should exclude those parts of military training that are not useful for us. Police officers need the tools to resolve conflict. That equipment includes equipment like body armor, Tasers, and firearms, even in the U.K. It also includes psychological tools. The paramilitary aspects of tradition, ceremony, and uniform help encourage esprit de corps, discipline, professionalism, and teamwork. These traditions and rituals help an officer not only deal with the threat during an incident but also the emotional impact long after the incident is over. And they are important for morale. Like the U.S., morale in the U.K. is at an all-time low at the same time officers face ever-increasing risks. Frustration boiled over in 2012 when 30,000 British police officers marched in London to protest reforms to British policing. These reforms are further diluting the traditional paramilitary aspects of the past and undermining the office of constable in the face of increasing anti-police sentiment among the public. At the same time, we should be asking whether or not police officers need camouflage uniforms. Has “tacticool” gotten out of control? Isn’t it important for people to feel that the police are not an occupying force? They are not diametrically opposed. That’s what I saw in in New York as I worked with local, county, and state agencies. I saw a balance of styles that worked well. I think it would be a mistake to throw that away. The job that law enforcement officers do is a difficult one. They deserve the best tools available, whatever their source.